Parents: Hasso and Susanne von Manteuffel. Wife: Married Armgard von Kleist (the niece of Generafeldmarschall Ewald von Kleist) on 23 June 1921 – two children. A highly respected tank leader of great ability, General der Panzertruppe Hasso von Manteuffel is best known for his role in the Battle of Bulge. In September 1944, he was summoned to Adolf Hitler’s military headquarters at Rastenburg where he received command of the depleted 5th Panzer Army then assigned to Army Group G on the Western Front. After seeing heavy combat around Lunéville and Arracourt in Lorraine against the U.S. 3rd Army commanded by Lieutenant General George S. Patton, Jr., the 5th Panzer Army was withdrawn from Army Group G in October 1944. Transferred to control of Army Group B in the Eifel region of Germany, the 5th Panzer Army began refitting for Operation “Wacht am Rhein” (Watch on the Rhine) – the last major German offensive of the war. On 16 December 1944, Generalfeldmarschall Walter Model’s Army Group B unleashed the offensive against the thinly held American front in the snow-covered Ardennes Forest. The overly ambitious plan called for the German forces to cross the Meuse River and capture Antwerp thus encircling those Allied armies north of the breakthrough. The 6th SS-Panzer Army, commanded by SS-Oberst-Gruppenführer und Panzer Generaloberst der Waffen-SS Josef “Sepp” Dietrich, would deliver the main effort in the north supported by the 5th Panzer Army in the center while the infantry of General der Panzertruppe Erich Brandenberger’s weak 7th Army would screen the southern flank. The German Ardennes Offensive proved a failure, as the 6th SS-Panzer Army, bogged down by congested roads and tenacious American resistance, could not exploit its initial breakthrough. Although tasked with a supporting role, von Manteuffel’s army made the deepest penetration of the offensive. The 2nd Panzer Division, commanded by Oberst Meinrad von Lauchert, managed to reach the town of Celles near the bank of the Meuse River before being smashed by the U.S. 2nd Armored Division with the British 3rd Royal Tank Regiment (29th Armored Brigade) in support. However, without the release of Dietrich’s armor reserves to von Manteuffel in a timely manner, the 5th Panzer Army soon lost its momentum as well. The failure to capture Bastogne from the stubborn “Screaming Eagles” of the U.S. 101st Airborne Division (thereby tying down substantial German forces) and the allocation of additional units to bolster the weak southern flank further sapped the 5th Panzer Army’s offensive strength. With the Ardennes Offensive clearly at an end, Hitler allowed a limited German withdrawal on 8 January 1945. Eight days later, he ordered the redeployment of Dietrich’s 6th SS-Panzer Army to Hungary for offensive operations against the Russians. Remaining on the defensive in the Eifel, von Manteuffel’s army was forced back to the Rhine by the advance of the U.S. 1st and 3rd Armies in February-March 1945. Relinquishing command of the 5th Panzer Army to Generaloberst Josef Harpe, von Manteuffel returned to the Eastern Front for his final assignment of the war. For more in-depth reading on the Battle of the Bulge, refer to The Ardennes: The Battle of the Bulge (Center for Military History Publication 7-8) by Hugh M. Cole, a volume in the official history of the U.S. Army in World War II. An online edition may be found at this link. 1908: Entered the Cadet Institute at Naumburg/Saale. 1911: Entered the Senior Cadet Institute at Berlin-Lichterfelde. 22 February 1916: Entered the Army as a Fähnrich in the Replacement Battalion of the Husaren-Regiment von Zieten (Brandenburgisches) Nr.3, Rathenow. April 1916: In the field with the 5th Squadron of Hussar Regiment 3 attached to the 6th (Prussian) Infantry Division. 12 October 1916: Wounded by shrapnel in the right thigh near Bapaume, France/in hospital. February 1917: Returned to the field and transferred to the General Staff of the 6th (Prussian) Infantry Division. November-December 1918: Protected the bridge over the Rhine at Köln from revolutionaries to safeguard the withdrawal of the Field Army from the occupied territories to Germany. 20 December 1918: Transferred to the Replacement Squadron of Hussar Regiment 3, Rathenow. January 1919: Second Adjutant of Freikorps “von Oven” in Berlin. May 1919: Transferred to Reichswehr Cavalry Regiment 25, Rathenow. 1920-1930: Squadron Leader in the 3rd (Prussian) Reiter [Mounted]-Regiment in the 100,000-man Reichsheer, followed by seven years of duty as the Regimental Adjutant at Rathenow. 1 February 1930: Chief of the Technical Squadron of the 3rd (Prussian) Reiter-Regiment. 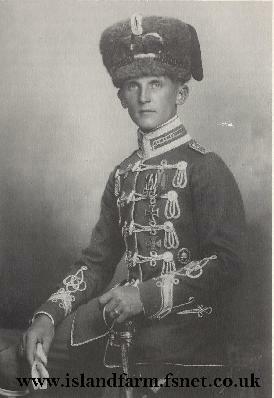 1 October 1932: Squadron Chief in the 17th (Bavarian) Reiter-Regiment, Bamberg. 15 October 1935: Squadron Chief in Motorcycle Rifle Battalion 2 of the 2nd Panzer Division commanded by Oberst (later Generalmajor) Heinz Guderian. 1936-1937: Major on the Staff and Training Officer of Cadets and Cadet Officers of the 2nd Panzer Division at Wünsdorf. 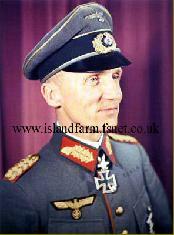 25 February 1937: Consultant in the Panzer Troop Command (General der Panzertruppe Heinz Guderian)/Army High Command. 1 February 1939: Course Leader at Panzer Troop School II in Berlin-Krampnitz. Hasso von Manteuffel directing operations from his command vehicle on the Russian Front. 15 July 1942-4 November 1942: Commander of the 7th Panzer Grenadier Brigade of the 7th Panzer Division during the unit rest and refit in France. 26 August 1943: Wounded in the back by a Russian air attack on his command vehicle/treated at the front and remained with the troops. Commanded by Generalmajor (later Generalfeldmarschall) Erwin Rommel from February 1940-February 1941, the 7th Panzer Division played a key role in the invasion of France in May-June 1940. Under Rommel’s command, the 7th Panzer earned the sobriquet “Gespenster-Division” or the “Ghost Division” – the speed of its advance left the French uncertain when or where on the battlefield it would appear next. Achieving the rank of Generalleutnant, Friedrich (Fritz) Freiherr von Broich commanded the 10th Panzer Division in Tunisia from 5 February 1943 until his capture on 12 May 1943. Among other prisoner of war camps, he was held at Island Farm Special Camp 11 during his captivity. On 10 March 1943, Oberst Walter Barenthin, the commander of Luftwaffe Regiment “Barenthin,” was wounded and evacuated from Tunisia. For Operation “Ochsenkopf,” Major Rudolf Witzig’s Fallschirmjäger Pioneer Battalion 11 joined with a company of anti-tank guns, an artillery battery and a 20mm anti-aircraft battery to form Group “Witzig.” Major Witzig had received the Knight’s Cross for his role in the daring glider-borne assault on the Belgian Fort Eben Emael on 10 May 1940. On 9 March 1943, Generaloberst von Arnim was appointed Commander-in-Chief of Army Group Afrika upon Generalfeldmarschall Rommel’s return to Germany. General der Panzertruppe Gustav von Vaerst, in turn, took command of the 5th Panzer Army. 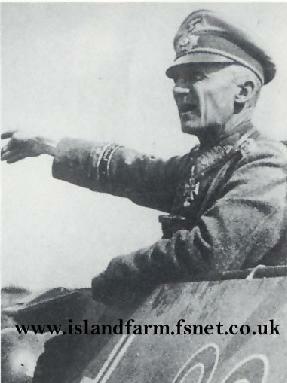 Among other prisoner of war camps, General von Vaerst was held at Island Farm Special Camp 11 during his captivity. 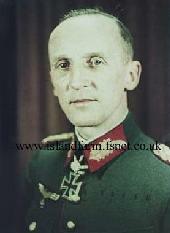 At the time of the actions around Zhitomir, Oberst Gottfried Frölich, the former commander of the 7th Panzer Division’s Panzer Artillery Regiment 78, led the 8th Panzer Division. 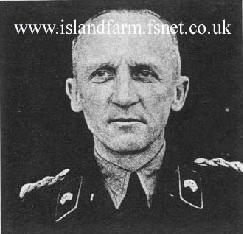 Attaining the rank of Generalmajor, he was held as a prisoner of war at Island Farm Special Camp 11. One of the 27 recipients of the Knight’s Cross with Oakleaves, Swords and Diamonds, Generalmajor Schulz had been a longtime member of the 7th Panzer Division’s Panzer Regiment 25. After serving as a company chief and a battalion commander, he assumed command of the regiment itself in March 1943. Eight days after taking command of the “Ghost Division,” he was killed in action at Shepetovka on 28 January 1944.